ORNL researcher Kaushik Biswas demonstrates how a self-healing barrier in a vacuum insulation panel can recover from a puncture. A building’s exterior endures wear and tear from natural elements over time. Wind, rain, snow and even harsh sunlight can do costly damage. But what if a building could heal itself from cuts, tears and punctures, saving time and cost? It may sound better suited for science fiction, but ORNL’s Building Envelope & Urban Systems Research Group may have found the answer to self-healing buildings by creating a novel multilayered barrier film with self-healing properties for vacuum insulation panels—or VIPs. VIPs consist of a silica, aerogel or glass fiber core with the air removed that is encapsulated within an impermeable barrier envelope. Because of their internal vacuum, VIPs are five to 10 times better at reducing unintended heat losses and gains through building walls and roofs than conventional materials such as polystyrene and fiberglass insulation. Although VIPs have proved to be more efficient, they’ve yet to be fully embraced by America’s building industry. Kaushik Biswas, a mechanical engineer and lead researcher on the self-healing project at ORNL, said a major reason for slow adoption comes down to durability. prevented them from being used as building insulation in the U.S. A common question from industry is, ‘What if someone puts a nail through a VIP?’ My answer is, ‘But what if we can develop a type of panel that can heal from punctures?’ It removes one of the major barriers to adoption of VIPs in buildings. Sciences Division researchers Tomonori Saito and Pengfei Cao to optimize the self- healing chemistry, demonstrating proof of concept through laboratory experiments. The team has started working on scaled-up self-healing films for VIPs. The work is a high priority for DOE’s Building Technologies Office, too, because some 40 percent of the nation’s energy is consumed in residential and commercial buildings. Combining materials research with heat transfer principles has been a primary focus of Biswas’ work at ORNL. He’s part of a research team with industry partners NanoPore and Firestone Building Products Company that developed a 2-inch-thick composite foam–VIP insulation board that can achieve thermal resistance of R25, more than twice that of typical insulation used in buildings. The composite boards contain a lower-cost VIP called modified atmosphere insulation, which was developed by NanoPore. 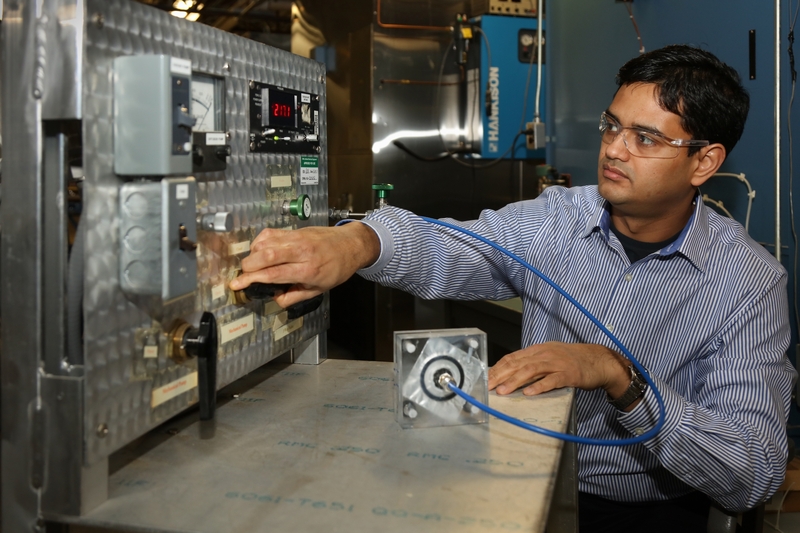 Biswas is also part of a team of researchers investigating alternative thermal management techniques for buildings, new kinds of vacuum insulation and energy storage technologies.